Can you imagine going into an interview for a new position and being declined because you have a certified afro growing in your nose? Nose hair is one of the more unsightly growths that can occur in our bodies, and trimming it is an incredibly important practice in your daily hygiene regimen. Nose hair does have a use; it actually prevents the growth of harmful bacteria in your body, so trimming to a reasonable length is really the goal here, not eradication. Many people use a pair of tweezers or grooming scissors to rid themselves of unsightly nasal hair, but there are dedicated devices out there that make the trimming of this hair very easy. To help you get a grasp on what’s out there; we’ve rounded up four great nose hair trimmers that will help you tame your wild nasal tresses. Our Gold Pick comes from Japanese Electronics manufacturer, Panasonic. Panasonic has had a long history of creating truly revolutionary consumer electronics that push the edges of technology. Their products range from home theater electronics to – you guessed it, nose hair trimmers. 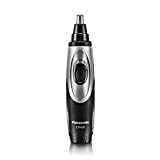 The ER430K Ear and Nose Hair Trimmer has a great set of features, and will easily become one of your favorite personal grooming items; as a matter of fact, as a Gold Pick product, you wouldn’t be the only one since gold status typically indicates that the item is beloved almost universally. 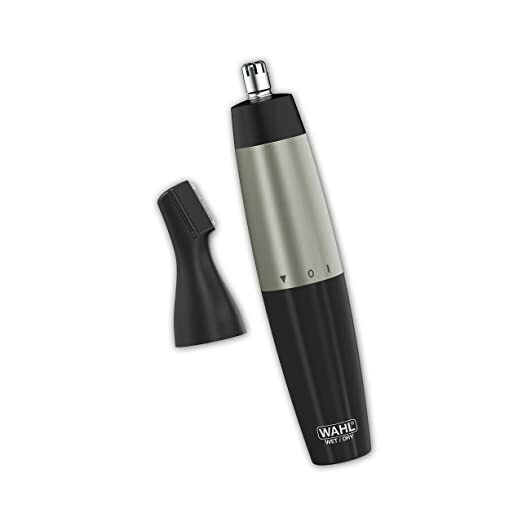 This ER430K Ear and Nose Hair Trimmer certainly deserves the accolades that it’s garnered. To start, its design is relatively simple, but its features are perfect for those looking for hassle-free trimming. 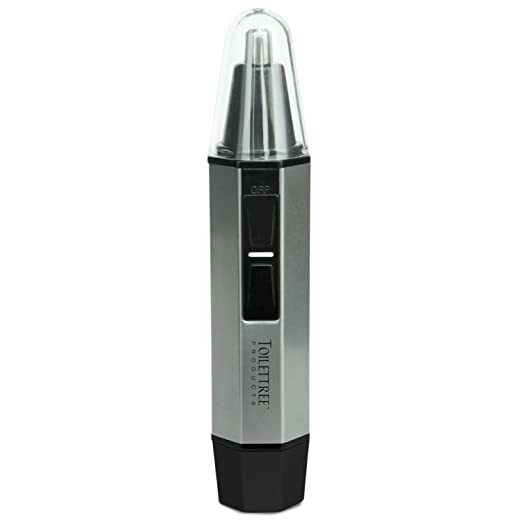 Aesthetically, the ER430K Ear and Nose Hair Trimmer is black and metallic, with a mostly plastic construction throughout. The grip itself is made of a soft material that has extra grip to prevent slippage. For the most part, the entire ER430K Ear and Nose Hair Trimmer has a very barrel-shaped form factor that’s about 5.6 inches long and one inch wide at its widest point. This simplistic design will ensure that it will fit in any bathroom décor. Aesthetic design is one thing, but what makes our Gold Pick shine is its built-in functionality. 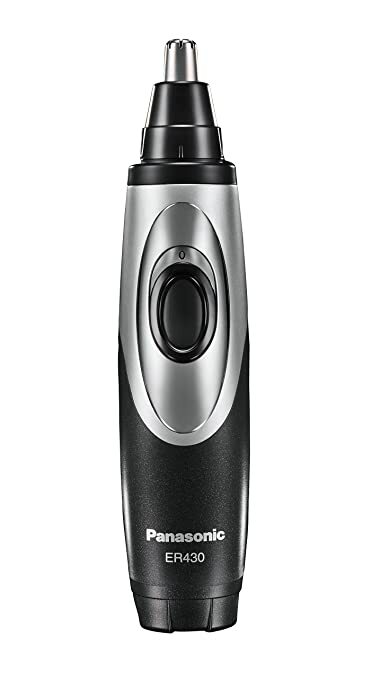 Panasonic employed a dual-edge blade cutting system for this ER430K Ear and Nose Hair Trimmer that eliminates uncomfortable snagging and cutting discomfort. When hairs enter the top portion of the main trimmer, a unique rotary blade system utilizes a circular blade action that cuts the hair evenly. Since the blades are dual-edged, there are actually two points of cutting, ensuring that errant hairs that enter the chamber are cut as well. The result is a more even, effortless cut that will quickly trim the hair in your nasal cavity. To assist in the cleanup of the cut hairs, this Panasonic device utilizes a vacuum system that pulls the shorn hairs into the body of the device, where they pass and are expelled from the rear section of the trimmers. This helps prevent clogs and keeps unwanted materials from collecting within the blade assembly. In addition to this cutting and disposal system, the actual blades are actually made of curved hypoallergenic stainless steel. Their curved nature ensures maximum reach coverage for loose hairs, and the hypoallergenic material ensures that you’ll not be plagued with after-shaving irritation if you have sensitive skin. You can fully submerge these nose hair trimmers in water, so cleaning is a cinch. It comes with a dedicated cap that will protect the cutting assembly when you are travelling. Interestingly enough, the cap actually has a mirror on it that’ll help you see where you need to trim, which is a perfect addition when you are travelling in a place that has little reflective surfaces. In addition to this travel feature, it also comes with a carrying back that makes the device easy to store amongst your luggage. You can also use this device to trim other facial hair, and even execute minor detailing on your beard or eyebrows. According to their site, Toilet Tree is “a family owned company with a silly name and intelligent products”, and their line of items ranges from LED mirrors to water-resistant MP3 speakers. Clearly, Toilet Tree, as a company, is dedicated to providing a line of great products that will help you get ready for your day. As our Silver Pick entry, their Water Resistant Heavy Duty Steel Nose Hair Trimmer with LED light has a lot going for it. It features quality construction combines with great features. This is one well-crafted Water Resistant Heavy Duty Steel Nose Hair Trimmer with LED light. The first thing that you’ll notice is that Toilet Tree utilized an all-steel construction for body of this nose hair trimmer. This adds a little bit of weight to the Water Resistant Heavy Duty Steel Nose Hair Trimmer with LED light, which is a good thing as it makes the whole thing feel much sturdier. The barrel of this device sports a hexagonally angled design that isn’t the most ergonomic, but still feels good in the hands while in use. The only non-metal aspect of this device is the on and off switch; this part is constructed of a rubberized plastic that is soft to the touch and slip-resistant. When it comes to quality features, Toilet Tree was sure to pack in quite a few that will make this part of your daily upkeep a breeze. Firstly, there is a very bright LED light at the tip of this Water Resistant Heavy Duty Steel Nose Hair Trimmer with LED light. You can use this light to really illuminate the inner surfaces of your nose, which in turn will allow you to find any areas that need additional trimming. The brightness of this LED is almost blinding, but it’s very useful when you want to be sure that there are no loose strands hiding in the recesses of your nose. When it comes to trimming, this nose hair clipper utilizes a rotary cutting system that works to avoid the snagging and pulling that some of these devices have become known for. Hairs enter from the top and sides of the cutting assembly and are sliced away neatly and efficiently. The blades are very sharp and move at several thousand revolutions per minute in order to provide a singular clipping experience. Also, like our Gold Pick, this trimmer can also trim and detail more than your inner nostrils. It works excellently on eyebrows, beards, and will cut those annoying hairs that sprout in your inner ear. When it’s time to clean the device, since it is waterproof, you can simply place it under a stream of water. This means that you can even utilize this Water Resistant Heavy Duty Steel Nose Hair Trimmer with LED light in the shower if you’d like to save a little time. Once you’ve finished using the device, simply reapply the protective cap and you can safely store it away until its next use. Wahl has been one of the premier names in personal grooming since the company’s inception in 1919. As a matter of fact, Wahl developed the world’s first cordless hair clipper, which utilized the company’s own rechargeable battery back in 1967. With such a prestigious history, you know that Wahl produces quality, and our Bronze Pick, which can be considered the descendant of that first cordless clipper, is a truly quality trimmer. Firstly, the first thing you’ll notice about this Wahl Groomsman Ear, Nose Hair, and Brow Trimmer is its barrel-shaped construction. Wahl has utilized an all-metal chassis that feels great in use and is also sturdy enough to take a few dings and drops. The shape definitely has a good, ergonomic feeling that will be comfortable to hold for the few seconds or minutes that you’ll be using this Wahl Groomsman Ear, Nose Hair, and Brow Trimmer. The one flaw in its design is the perfectly rounded barrel, which can be slightly slippery feeling; especially if your hands are wet. From a features perspective, this is a fairly standard trimmer. It doesn’t have any special cutting method, though you shouldn’t experience much in the way of painful snagging when using it. What makes this Wahl Groomsman Ear, Nose Hair, and Brow Trimmer unit shine is the additional trimming units that come packaged with it. Whereas the prior trimmers had cross usage features for detailing eyebrows and beards, this Wahl unit actually utilizes additional heads for more precise trimming of these areas. Packaged in with the Wahl Groomsman Ear, Nose Hair, and Brow Trimmer is a detailed head and an eyebrow guide. You can use the detail head to trim up your beard and it employs a straight trimmer so that will allow you to shape your unwanted hair with straight edges. The eyebrow guide, on the other hand, will ensure that your eyebrows are at a reasonable length. Like the previous trimmers that we’ve covered, the Wahl Groomsman Ear, Nose Hair, and Brow Trimmer is water-resistant, so you’ll easily be able to clean it with a stream of warm water. Its additional heads make this a great device to use in the shower since you’ll be using it to trim multiple areas of your face and ears. The rotary head that is the default trimmer is also very good at trimming stubborn hairs and has very sharp blades that cut from the side and top of the assembly. On Amazon, this device only has about 12 reviews but the overwhelming majority of these are of a five star rating; as a matter of fact, an even 92 percent of these 12 reviews are of this rating level. The singular three star review actually centered around a faulty head that had a non-working locking mechanism. Outside of this, the remaining 11 reviews cite that this device has a great battery life (it uses a single AA) and is very reliable. Keeping your nose hairs in line isn’t something that you’ll ever have to spend a lot of money on. The majority of these devices come in under a $20 price point, but what if you are ballin’ on a budget and need a device that can trim your nose hairs at a lower cost? Fortunately, Keda has produced a device that is perfect for the baller who is currently on a budget. For a $10 price point, this Keda Ear and Nose Hair Trimmer have a lot of great features. Firstly, it’s very ergonomic and has a plastic barrel that fits neatly in the hand. It’s semi-rounded, yet has enough grooves and surfaces on its body to make it really hard to drop accidentally. Admirably, Keda has also used an environmentally friendly process in constructing this device. 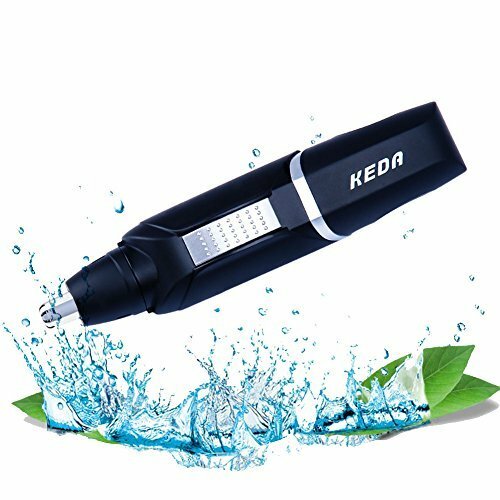 The Keda Ear and Nose Hair Trimmer’s main switch features several rows of tactile bumps that will make operating this device easier; even with wet hands. 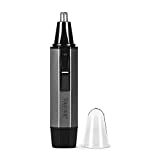 When it comes to trimmer functionality, the Keda Ear and Nose Hair Trimmer utilizes a rotating blade that can spin at a rate of 6800 revolutions per minute. This snag-free process is easy on the nose and is assisted by the inclusion of a relatively bright LED at the head of the device. Like our previous picks, the entirety of the device is waterproof, so you’ll easily be able to use this trimmer in the shower. For cleaning purposes, simply remove the head and you can shake or rinse out the interior of the Keda Ear and Nose Hair Trimmer with ease. Many different factors affect the price of nose hair trimmers. Since these are all mechanical items that have motors and power sources, the price of components will always be a major contributor to the cost of one of these devices. Sure you can pick up a cheap version that has weaker components and a shoddier overall construction, but this type of device is sure to wear out sooner rather than later, and you’ll have to purchase a new trimmer. Also, feature set also comes into play when you are pricing a nose hair trimmer. Simply put, nose hair trimmers can have a variety of extra features that will add cost to the overall device. We’ll get more into some additional features that nose hair trimmers can have, later. As machines, all nose hair trimmers will require some sort of power source. This can range from devices that are battery powered to devices that plug into a wall outlet. When seeking out a new device, be sure to consider the power source. Batteries give you a certain amount of freedom because you will be un-tethered. Another factor that you’ll want to consider is how long will a set of batteries actually power your future nose hair trimmer? You’ll want to find a device that’ll at least last for several months before the batteries will need to be replaced. For wired devices, remember that this is an item that can and will get wet, so you’ll want to be extra careful when plugging and unplugging the cable. Also, the wires from wired nose hair trimmers can get in the way while you are getting ready, so consider the convenience level of this type of device when you’re making a decision. Built-in Vacuum – For the most part, a built-in vacuum is there to pull hair and loose particles from the area that you are trimming. Some devices pull the material into a compartment that you empty at your convenience, and some simply dump the detritus out the rear of the device. In any situation, a vacuum is very useful for helping you avoid irritating cut hairs getting caught in your nose after a trim. A LED – This provides a visual aid for your trimming. In models that sport an LED or some other form of illumination, a light is shined out from the leading edge of the device and with it you’ll be able to see what’s going on in your nose; thusly enabling you to efficiently manage all the area inside your nostril. Ergonomic Design – This might not seem like an extra feature, but having an ergonomic, slip-free grip is a very good aspect that some manufacturers don’t include in their devices. An ergonomic grip will make trimming easier, as the contours of the device will fit your hand perfectly. Extra Heads for Different Parts of Your Face – Needless to say, you don’t necessarily want to trim the inside of your schnozz, and then trim your eyebrows. For multi-clipping trimmers, it’s great to have a separate head for different parts of your face. This way, all you’ll have to do is trim as you need in your nose and then switch heads to trim the area around your eyebrows. Nose trimmers come in a variety of build qualities. Some units are entirely comprised of metal, whereas other units are comprised of plastic and rubber. With materials like metal, you can expect your device to be fairly durable and be able to take a hit, but with this type of trimmer, you’ll want to avoid it being wet when you’re done with it, as wet spots can cause damage to the body of the device. Plastic trimmers are great as well and are typically durable and may or may not have a softouch rubberized grip on the handles that will make it harder to lose your hold on the device. Personal grooming doesn’t have to be an arduous process that takes up a ton of time in the morning. With devices like this, you can quickly trim your nose hairs and get on with your day without worrying about irritation and discomfort. This list of nose hair trimmers has many great products that come from some great manufacturers, but if they don’t work for your needs, please consult our pre-purchase considerations section for some rough guidelines that will help you find a device that will be more up to par for you. In any situation, we hope that this list has helped you find the device that works best for you.